Ever since The Boy was young we have enjoyed visiting the zoo. We’ve done our fair share of zoo-hopping. In fact, we visited so often, I purchased a membership when I discovered that we could visit zoos all across the country for free through the reciprocal admission program offered by AZA. So now, where ever we travel, we always consider the zoo as an activity. I have put together this roundup of what you need to know before you go. 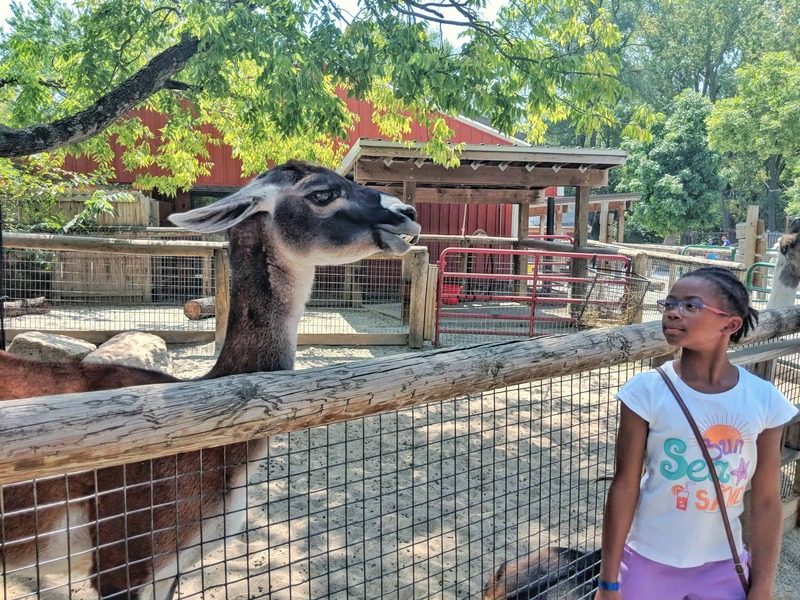 From the cheapest days for admission to other attractions in the area so you can make a weekend trip out it, here’s a list of 9 Midwestern zoos to visit with your family. We visited Blank Park Zoo on Alexandra’s off day from the track during the Junior Olympics in Des Moines. It was one of the few times Olivia wasn’t with us, so our little animal lover was free to do whatever she wanted. We upgraded her ticket to the full experience pass and saved a little money on the extras. Admission: $14 adults, $8 children 12 and under. Purchase online for a discount. AZA Member: Yes. They participate in the reciprocal admission program. Food Options: Fast Food style options onsite. No outside food is allowed, but a picnic area is available near the parking lot. I grew up visiting the Cincinnati Zoo. Yes, the same Cincinnati Zoo where a little boy fell into the gorilla pit. So when I was able to take my own children I was thrilled. Nestled on a hill in one of the city’s residential neighborhoods, Cincinnati Zoo & Botanical Garden centers your experience on the animals and the beautiful plants and flowers that create their habitats. Admission: The cost of admission varies by day and demand, but plan for at least $15 for adults and $9 for children. Online purchases are $2 less than at the gate. AZA Member: Yes. They participate in the reciprocal admission program. Learn more here. Parking: $10 per car for the on-site lot. There is free street parking in the residential neighborhood surrounding the zoo. Food Options: There are a variety of places throughout the zoo to make food choices, including reduced menus from local favorites Skyline Chili, LaRosa’s Pizza, and Greater’s Ice Cream. Best Suited: All Ages. Be prepared for lots of walking. This was another zoo we visited on an off day from a week-long track meet with Alexandra. Olivia wasn’t super excited about the idea of going to the zoo, but she had a great time too. Detroit Zoo is a great choice for older children, tweens, and teens. Admission: The cost of admission varies by day, but plan for at least $13 for adults and $10 for children when you purchase online. Same day tickets are $18 for adults and $15 for children (ages 2-18) and seniors at the gate. Parking: $8 per car for the onsite parking garage when you purchase online. Food Options: You can bring your own food and drink and eat at one of the many picnic areas throughout the zoo. If you’d rather dine onsite, Arctic Cafe’ and Wild Burger Detroit are sit down places with full meal options. There are also a variety of snack shops serving everything from ice cream and popcorn to vegan smoothies. Special Exhibits: 4-D Theater and Simulator Ride, Polk Penguin Conservation Center, and the Tauber Family Railroad. Best Suited: All Ages. Even your teens and tweens will have a good time. Just a few blocks from Lucas Oil Stadium, the Indianapolis Zoo is one of the many family-friendly attractions in the downtown area. One of the smaller parks we’ve visited, you can easily experience all it has to offer on a day’s visit. Bundle your stay with a visit to the Indianapolis Children’s Museum by booking a Family Fun Adventure through a participating hotel. Admission: The cost of admission varies by day and demand, but plan for at least $13 for adults and $10 for children when you purchase online. Same day tickets are $24.70 for adults and $18.70 for children (ages 2-12) at the gate. Parking: $8 per car for the onsite parking garage when you purchase online. Larger vehicles, like campers, may pay more. Food Options: Fast Food style options onsite. Drinks with disposable lids and straws are not permitted. Only beverages and small snack items in reusable containers can be brought into the zoo. Best Suited: Families with children up to tween age. Most zoos I’ve been to are either nestled into a residential area of the city or off in the sticks of the suburbs. Not Lincoln Park Zoo. It sits just north of downtown Chicago. A smaller park with fantastic views of the city skyline, Lincoln Park Zoo is free to visit. Parking: Zoo members can park in the zoo parking lot. There is metered street parking for non-members in the surrounding area, but public transportation or ridesharing is the best option. Food Options: Try everything from small plates and a glass of wine with a view of the city skyline for mom and dad to authentic Chicago style hotdogs for the kids. there are snacks bars and ice cream shop to enjoy a treat onsite as well. Best Suited: Children up to tween age. The first time we visited the Louisville Zoo, Trevone was 6. We have been to the zoo countless more times since that first visit and it continues to grow and expand. A smaller zoo, you can visit the park and the nearby MegaCaverns or Louisville Nature Center in a day’s visit. Admission: Admission begins at $17.75 for adults and $12.75 for children 3 – 11. Save $1 per ticket when you purchase online. Parking: $6 per car for the onsite parking lot. Food Options: Fast Food style options onsite. Alcoholic beverages, drinks with disposable lids and straws, and glass containers are not permitted. Picnic areas are avialbel throughout the park. Mesker Park Zoo was the first place we ever experienced animal feedings. And that was back in 2011. A small zoo on the outskirts of Evansville, Mesker Park is a great place to visit with smaller children who can’t withstand a full day of activity. Admission: The cost of admission is $9.50 for adults and $7.50 for children 3 – 12. Parking: Parking for cars and personal vehicles is free in the main lot. Larger vehicles must park in the additional lot. Food Options: Outside food or drinks are not allowed, except water in a reusable bottle. The Rainforest Grille is available for food purchases. The kids were very young when we visited the Nashville Zoo, so my fondest memory is of the safety playground for little ones. A smaller zoo, you can experience the entire park in a half day visit, which may be more than enough as I recommend this zoo for families with small children. Admission: The cost of admission varies by day starting at $17 Adult, $12 Children 12 and under Monday – Thursday. Add $1 for Friday & Sunday, and another $1 for Saturday. walk up prices are $20 for adult and $15 for children. Parking: $7 per car for the onsite parking. Food Options: I recommend you bring your own food, but no glass bottles or drinks with disposable straws are allowed. There are a few onsite food options. One of the great things about St. Louis Zoo is that it is free to enter. Located in Forest Park, be prepared to explore the entire area for a day or two to take it all in. Ride the Trolley through the park from the zoo, to the science center and planetarium, to the history museum, to The Muny. Even the tween was surprised by it all. Admission: Free. Additional zoo experience packages can be purchased online or at the gate. AZA Member: Yes. Admission to the zoo is free, but the reciprocal admission program applies to other locations if you have a membership. Parking: Parking in the zoo lots will cost at least $5 and as much as $15. Find a free in Forest Park and hope the Forest Park Trolley for just $2 per adult, $1 for children. Food Options: Each of the zoo’s five sections has an option for a meal. There are several snacks, drinks, and treat stations throughout the park. You may bring your own cooler or picnic basket, but glass bottles are not allowed. Best Suited: Children up to Tweens. It’s a very large zoo and not suitable for those with mobility challenges.